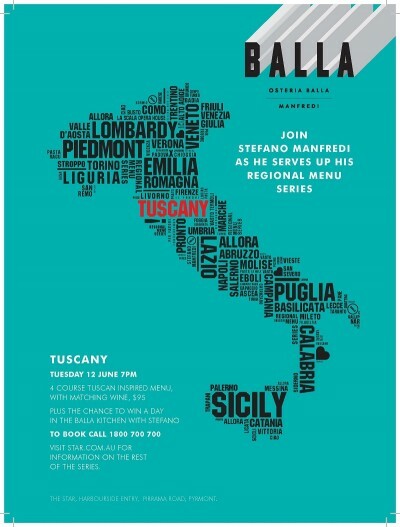 The Italian Regional Menu Series at Balla kicks off on Tuesday June 12th at 7pm . The Italian Regional Menu Series at Balla kicks off on Tuesday night June 12th . Join Stefano Manfredi and Gabriele Taddeucci on a Culinary Trip to Tuscany. Enjoy four courses inspired by Tuscany, with matched wines for $95 per person. Wines selected and served on the openning night by Balla Sommelier Fabio Danzi will be courtesy of our dear friend and importer of fine Italian wines Marco Balestrini of Lario Imports. Balla kitchen with Stefano and Gabriele. Book now by calling 1800 700 700.